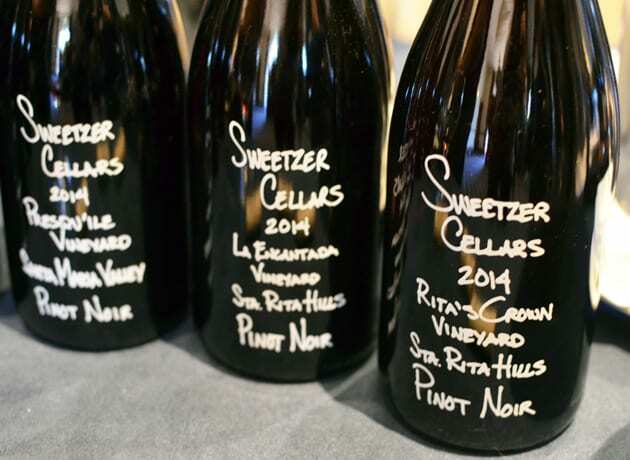 I first sampled the wines of Sweetzer Cellars at a Pinot Noir wine tasting in Santa Barbara. Since then I have sampled their wines on three other occasions including a luncheon with LA Wine Writers. If I were to pick one of the rising wine stars I discovered this year it would definitely include Sweetzer Cellars. Their forte being Chardonnay and Pinot Noir. 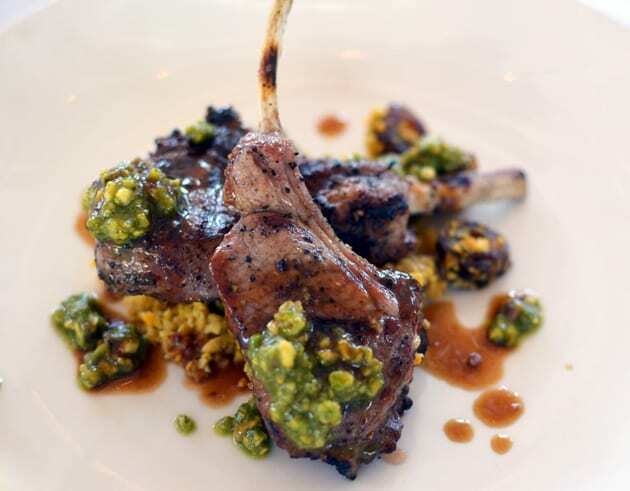 They are creating a name for themselves showcasing the wines of Santa Barbara County. They have made strides in the last year including the opening of a tasting room on the Lompoc Wine Trail in the Lompoc Wine Ghetto. For Michael Fogelman and Lisa Liberati it started in their small apartment on Sweetzer Avenue in West Hollywood. They were making wine utilizing their entire white-carpeted apartment as their cellar. 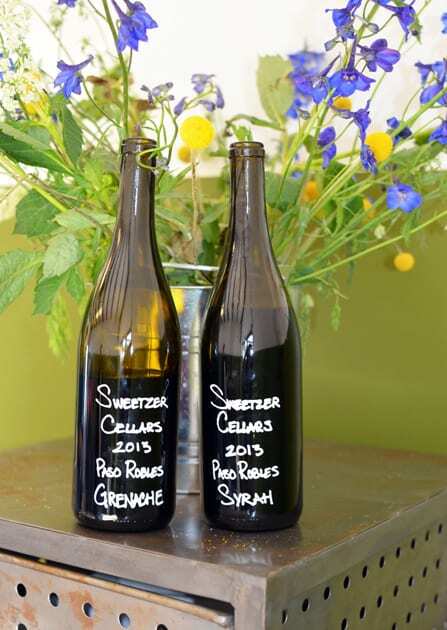 Hence paying tribute to their beginnings, Sweetzer Cellars became their winery name. Their first vintage release was produced in 2013. Michael and Lisa are self-taught but their desire to make wine came after a trip to Burgundy in 2008 where they learned winemaking. Both Michael and Lisa are SAT tutors in Los Angeles when they are not making wine. Passion is quite evident after meeting Michael and Lisa. Not only do you feel their passion but also with each sip of their wine especially the Pinot Noir you can feel their love of what they are creating. 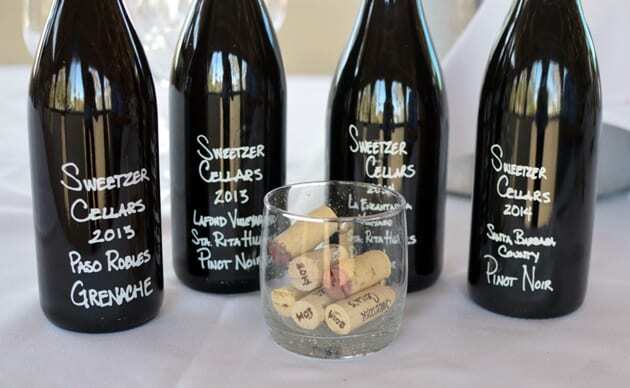 My first exposure to Sweetzer Cellars came about after sampling three wines, which impressed me because of the freshness, balance and consistency each exhibited. My favorites were the 2013 Sweetzer Pinot Noir, La Fond Vineyard, Sta. 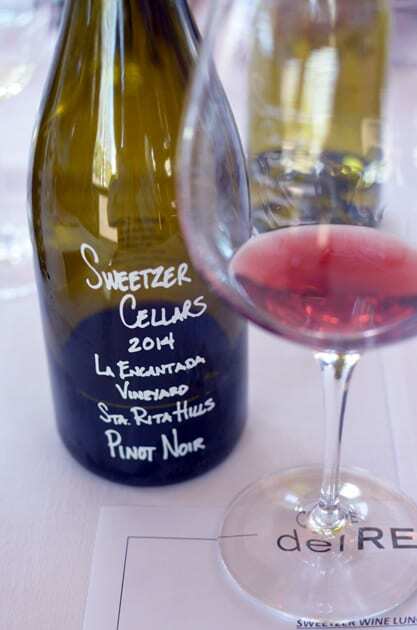 Rita Hills, the 2014 Sweetzer Pinot Noir, La Enchantada, Sta. 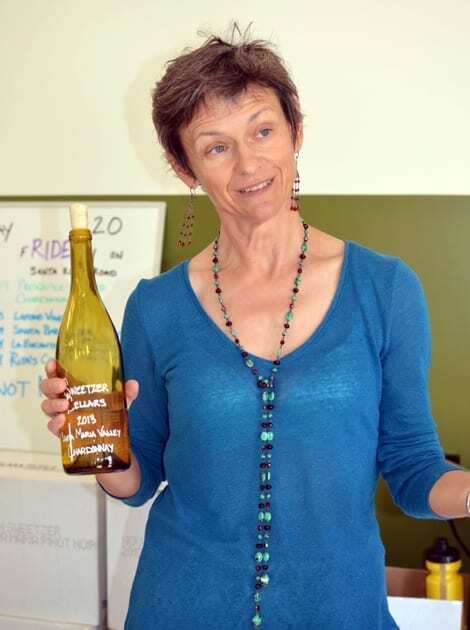 Rita Hills and the 2014 Sweetzer Pinot Noir, Santa Barbara County. The later is a blend of Michael and Lisa’s favorite vineyards in Santa Barbara County. This tasting was followed by a meeting with Brian Cousins and David Vilchez of Café Del Rey to pick the wines for a LA Wine Writers luncheon. 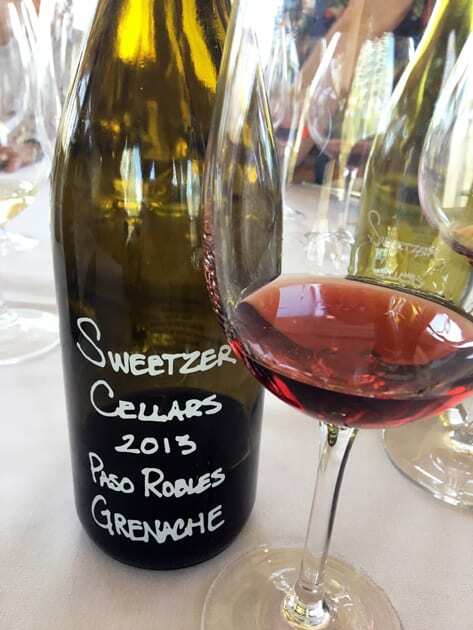 At this tasting I discovered Sweetzer Cellars Grenache and Syrah. Both are excellent with a subtle elegance that I quite liked. Sweetzer’s take on these wines do not resemble the big bold wines that we often find in Paso Robles but a nice lighter bodied wine. LA Wine Writers met at Café Del Rey to enjoy a luncheon with Michael presenting the Sweetzer Cellar wines. 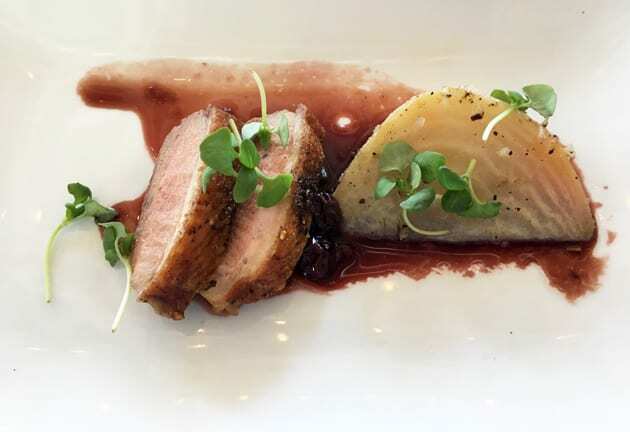 Café Del Rey and Chef David Vilchez did a superb job of pairing the wine but the dish that seemed to compliment the wine the best was the Duck Breast with berry sauce and beets. It complemented the Pinot Noir marvelously. We started our luncheon with some of the Sweetzer Cellar Chardonnays. 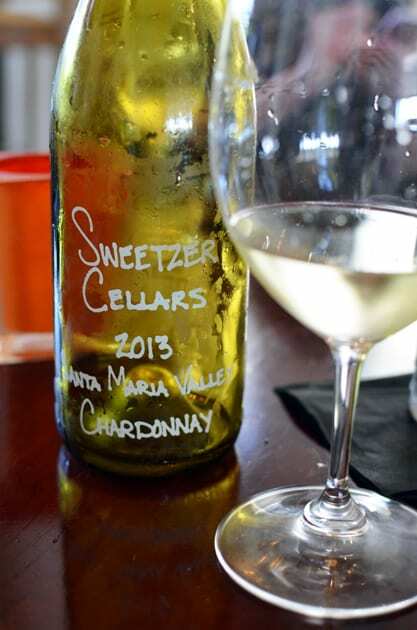 Sweetzer’s focus with Chardonnay is keeping the wine clean. A perfect example of this is the 2013 Chardonnay Santa Maria Valley. The wine is a blend of 4 clones. The intention was to create an unoaked but due to a glitch with the tanks 15% saw new French Oak for one month. The result is a very Burgundian styled Chardonnay with a wonderfully crisp approach that shows off the acidity and minerality. 2014 Chardonnay Santa Maria Valley exhibits flavors of apples. The difference between this Chardonnay and the 2013 is 60% ferments in stainless steel while 40% ferments in oak and aged 18 months. Michael finds that his blends are ready sooner than the single varieties. The Pinots from Santa Maria are smokier with hints of tobacco while those from Santa Barbara County display more florals. 2013 La Fond Pinot Noir, a well-balanced wine, light in body is composed of clones 115 and 777 and aged 14 months in 30% new oak. Like my first time samplng this wine it held up in stature. Although we had other Pinot Noirs including another favorite the 2014 La Encantada, which I enjoyed at my discovery of this winery, it was the 2013 Grenach the hooked me again at this tasting. My latest encounter with Sweetzer just occurred last week during a visit to Lompoc. Sweetzer Cellars is about to have their grand opening of their tasting room in the Lompoc Wine Ghetto. They are open Friday – Sunday from 11-5 pm so stop by and check them out. The wines are well worth the visit, as you will discover after visiting. I am anxious to see how this winery grows in time. With the passion and ambition of both Michael and Lisa they will go far. Right now I look forward to sampling their 2015 release this fall. 308 C N 9th St.